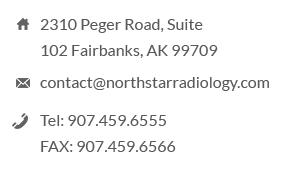 North Star Radiology provides high-quality imaging services in MRI, CT, ultrasound, and x-ray. We have compiled information about a few of our basic imaging studies to help patients obtain a better understanding of their tests. Our staff and radiologists are also happy to answer any additional questions you may have. For further information, we have added links to RadiologyInfo™. RadiologyInfo™ is the public information Website developed and funded by the American College of Radiology (ACR) and the Radiological Society of North America (RSNA). RadiologyInfo™ was established to inform and educate the public about radiologic procedures and the role of radiologists in health care, and to improve communications between physicians and their patients. Note: The information contained within this website should not be considered medical advice and is not intended to replace the consultation of one of our qualified radiologists. North Star Radiology has compiled this information to the best of their ability; however, it is possible there may be more current information following the posting of this information. Please consult your physician and/or radiologist for information pertaining to your particular situation.